Cross Shaft fragments, dated to early ninth century, lower fragment. The stone has been broken and the frame is mutilated. It is an Ascension scene, New Testament, Luke 24:50, John 14:2; 16:7. 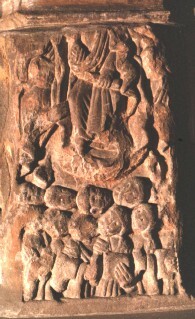 Christ is at the top of the panel and has the appearance of being seated. His right hand is raised in blessing and his left is holding a scroll. There appears to be an angel on either side of him. Christ's head is missing and the figure on the right is damaged. Below Christ there are a number of heads, eleven, turned upwards. These are probably the Apostles. Four of the figures in the front row are holding books. These may represent the Evangelists. Cramp, R.J., Corpus of Anglo-Saxon Stone Sculpture, Vol. 1, Durham and Northumberland 1st, Oxford University Press, Oxford (1984) Stones, Sculpture, Anglo-Saxons, England..